To my very loving friends Mr [Michael] Lok, Mr [Edmund] Hogan, & others the Commissioners for the voyage to Meta incognita [‘Boundary Unknown’ – re Northwest Passage]. After my very hearty commendations, understanding of the wise proceeding & orderly dealing for the continuing of the voyage for the discovery of Cathay by the north-west which this bearer, my friend Mr Frobisher, hath already very honourably attempted, and is now eftsoons to be employed for the better achieving thereof, and the rather induced as well for the great liking her Majesty hath to have the same passage discovered as also for the special good favour I bear to Mr Frobisher, to offer unto you to be an adventurer therein for the sum of one thousand pounds or more, if you like to admit thereof, which sum or sums, upon your certificate of admittance, I will enter into bond shall be paid for that use unto you upon Michaelmas Day next coming. Requesting your answers therein, I bid you heartily farewell from the court, the 21 of May, 1578. Oxford invested heavily in Martin Frobisher’s voyages to the CanadianArctic, known at the time as Meta Incognita. In the above letter Vere is offering to invest £1000 in Frobisher’s third voyage, to be secured by a bond due on 29 September 1578. Volume 2: 1513-1616 (1864), pp. 43-44. 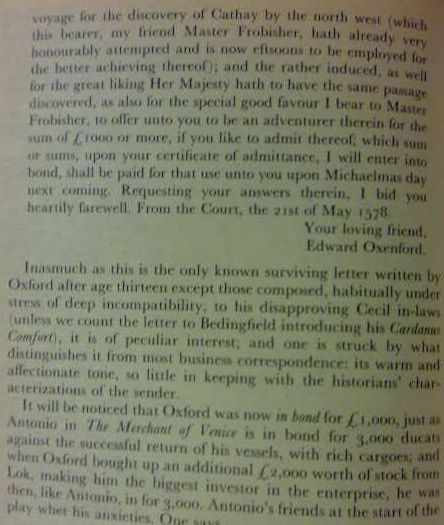 *this line is invariably left out by Stratfordian Historians; a cozener is a conartist – Lok conned Edward de Vere into taking his £2000 share thus bringing up Vere’s total exposure to £3000. cf. Merchant of Venice’ Shylok 3000 ducats.